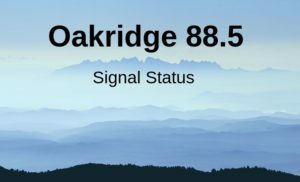 KRVM covers a wide area with our broadcast signal, reaching from Oakridge to the Oregon Coast. From time to time we experience issues with equipment that cause a drop in signal quality. On this page, we will list any known issues, and we’ve provided a form below for listeners to report issues with reception. What is the location of the issue? Be as precise as possible, include GPS coordinates if you are able.